As I’ve mentioned before, Rosebud loves to play in the water. Even when she was a newborn, she enjoyed baths. So, I know that if I can’t think of anything else and won’t mind a bit of clean up, I can entertain her with water. This time, I decided to go with a bubble bath theme. She got excited when I filled the tub with water, added a couple drops of dish liquid and watched the bubbles form. She laughed when I couldn’t get the baby doll to stay in one spot for the picture and she was impatient to start playing. She played with this tub for almost an hour. We did lots of scooping and pouring, counting how many scoops would fill each bottle and briefly washing baby. She was much more interested in what could be done with the water. The interest in the doll didn’t come until the end when I realized she was filled with water. I had to take her apart to get the water out. First, I had to take the head off and had trouble putting it back on. Rosebud thought this was funny. there was still a ton of water left in the body so I had to remove one of the legs. I struggled to get it back on and Rosebud thought this was great. We finally got the poor baby back together. 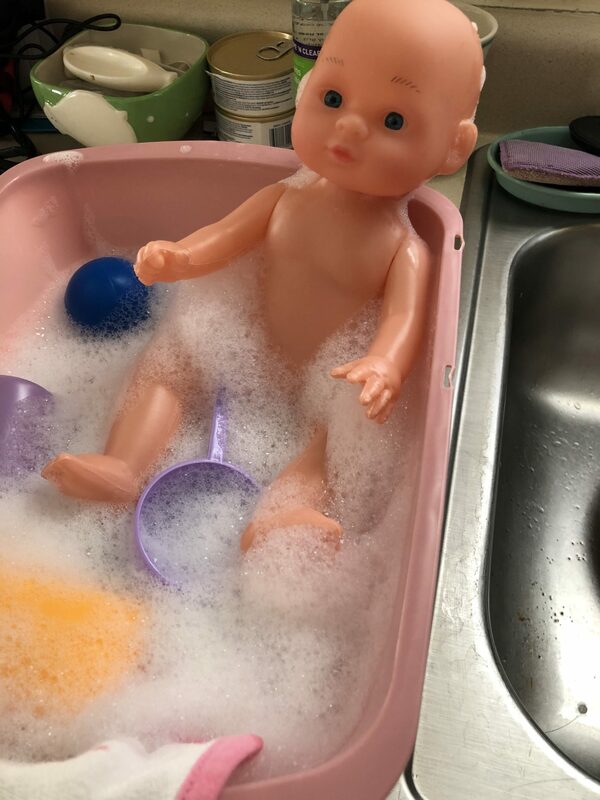 I learned I won’t be using that particular doll for bath time adventures ever again. Luckily, I have another one that will be easier to clean.